Having booked four days off work this week it was welcome news to see the high pressure building, but not so welcome was the wind. Tuesday looked like one of the better days with 8mph rising to 10mph later in the day. Arranged to meet up with Mike from Aber but the strong sunshine had me out of bed at 6.30am and sorting out the ducks and hens before heading over to the coast for an 8am early start on the water. Surf was low and everything looked good for another bash at the bass, pollack and mackeral. Loaded up two older spinning rods, an old spinning reel and a new baitrunner reel loaded with some 20lb braid. A new xrap lure one one rod and a large slug go sandeel on a 5/0 hook on the other, and I was off to the first mark after checking in on the vhf with Milford coastguard. There was a bit of chop about on the first mark but nothing to worry about. Tried the sandeel lure and then the new sub surface lure for around an hour and a half with no success on the last of the flood. 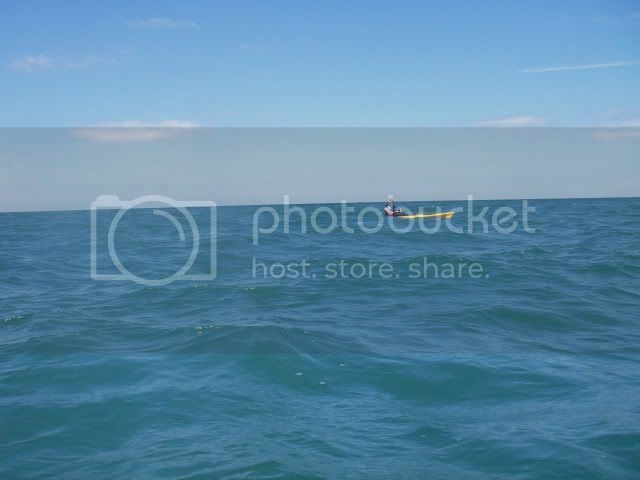 I paddled back in to the launch point to look for Mike and to take a loo break. The water flattened out a lot so I relaunched and tried the same mark again, fishing the sandeel just above the bottom for pollack whilst plugging with the other rod. Freelined the sandeel imitator on the baitrunner reel and then changed over to a small weighted trace to get it back near the bottom. Mike appeared around 1030 so I paddled in for a chat and then we both paddled out to a second mark on the very last of the flood tide. There was a fair bit of chop on the waves by now with an increasing breeze so we headed north of the mark and then started a long drift back on the ebb, using sandeels and plugs. Over the second mark I at last had a follow on a surface lure and then had two light hits over the same rough ground. Unfortunately no hook up on either hit and I took some shore rest to sort out a wind knot on the braid. Paddled back out to rejoin Mike in increasing choppy conditions and tried some more spinning and plugging at various distances from the shore. Nothing doing, so we paddled back down on the ebb and in to shore. No sign of mackeral close in, and the cloudy water and bright sunshine meant the bass didnt want to play either. Surprised that neither of us had a pollack, as in recent weeks it has been hard to get through the small pollack to the bass. We both managed to get back in without any surf trouble, so it turned out to be a fishless day but it was at least nice to be out for a paddle for most of it. Look at the colour of that water! Gorgeous. Can we meet you in say, about a fortnight? Careful calling Moniar gorgeous, someone here may offence. 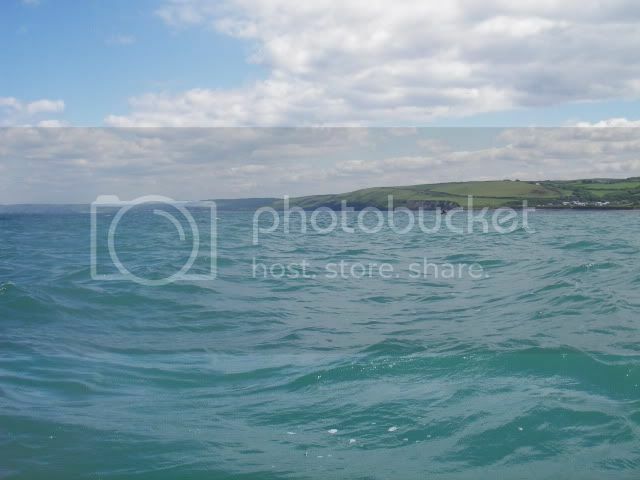 Not quite as nice as it was at Tenby and Saundersfoot today - crystal clear and so hot it felt like the Med! Yes, hopefully the wind will be low either next weekend or weekend after. I may have to be up in N Wales on one of those weekends but we can sort something out. This weekend is noy looking good wind wise so I may get out again tomorrow whilst the wind has dropped. Sold my second solo kayak this week but should be getting a brand new tandem kayak either tomorrow or before the budget next week (!) to beat the vat rise. Have a couple of people in work interested in buying one or two as well so am going to try to negotiate a bit more discount at a local supplier down here. PM me or phone us if you are interested in buying/ordering one before next week and I will let you know what discount is available. He is not home, not this weekend, the weekend after so we cannot buy one straight away. We have just discovered that a friend has two and no storage space for them as they are having a new kitchen fitted. We have loads of storage space. Ta da! Fancy coming here one day, barbecue of fresh mackerel on the beach at the end of it? Great to read the report, even without fish. An american once said to me "a bad days fishing is better than a good day at work"
Can't wait for my marine radio to get fixed, would have been lovely out at the weekend, certainly wernt any fish from the beach. Yep, that looks like we are here and not doing anything. "Sold my second solo kayak this week"
You don't have any more solo kayaks to sell do you? I am looking for one (if I can pluck up the courage to go out on my own!) as the rowing is a bit slow at present , meant to catch up with you at the Smallholders show but missed you and WVG. You will have to come and join us. I will let you know when we have confirmed things. Careful calling Moniar gorgeous, someone here may take offence. Indeed. Wales is after all...now what was it again? ...that insignificant lump of mud they call Wales? Sorted then - weather permitting. We can decide either Saturday or Sunday nearer the time, depending on weather, wind and tide etc. 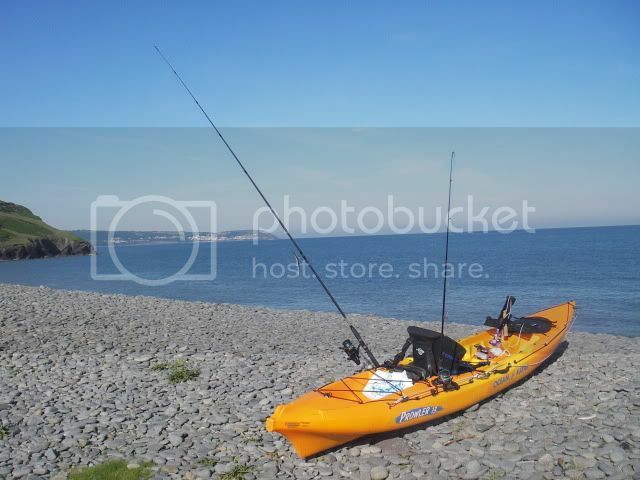 Dont have any more to sell as am keeping my remaining one, and will be buying tandem kayak tomorrow (Ocean Malbu 2 tandem). Always best to try before you buy so you can find one that suits you and your intended pupose for it. 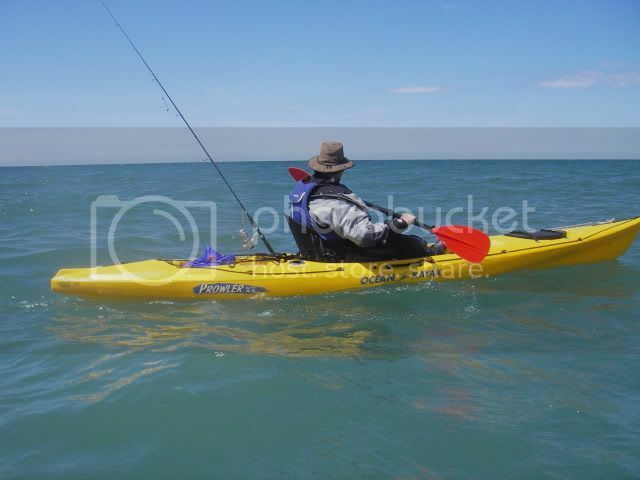 You can have a go in my Ocean Prowler 13, as that is still one of the the best all round fishing kayaks around, and also try the tandem kayak. I keep an eye out on ebay and a number of local kayak forum sites for decent second hand kayaks, so if you try a few out and then decide what type suits you I can keep an eye out for one second hand. Happy to give you any advice you need on choice of kayak for fishing or touring, and to go through the self rescue stuff in some safe location. I found it takes a bit of courage to go out solo on the sea but its also very rewarding (bit like solo climbing!) if you manage the risks carefully. Ummm weather looks ok for Saturday but the wind is a bit too strong for fishing - could come up in the morning and have a couple of hours fun over high water on the beach as its an onshore wind so may be some surf to play in on the kayaks. We have to be somewhere early evening so a late morning to mid pm time period would suit us on Saturday. Or we can leave it until a fortnights time and hope that the wind will be lower? PM me to let us know whether you want to give Saturday a go.